Chicago police said they met with organizers, alongside Illinois State Police, and "relayed to them that entry onto the expressway is unlawful." As travelers and authorities brace for another Chicago protest aiming to impact a major roadway during what's expected to be a busy holiday commute, police remained adamant that "traffic will be uninterrupted." 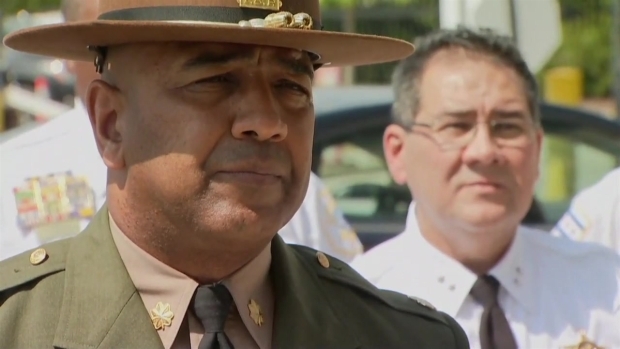 In an unrelated press conference Friday, Major David Byrd, the regional commander for the Illinois State Police, said the department has given organizer Rev. Gregory Livingston several options outside of walking onto the Kennedy Expressway near O'Hare International Airport. "There are several options that we’ve given him," Byrd said. "I don’t want to get into what they are but at the end of the day one option is not walking on the expressway." Byrd said that police "are prepare for any and all contingencies," including for arrests to be made. Major David Byrd with Illinois State Police talks about a planned protest on Labor Day aiming to shut down the Kennedy Expressway near O'Hare International Airport. Authorities stressed Friday that entering an expressway is illegal, but organizers have so far not backed down from their calls to shut down the major roadway near the airport. "Let’s not forget that shutting down expressways is illegal – that’s number one," Chicago Police Supt. Eddie Johnson said. "You start talking about shutting down operations at O’Hare Airport, now we’re going to federal issues." In nearby Park Ridge, Chief Frank Kaminski said the city is planning to have extra officers on hand, though they're "hoping this is going to be a peaceful event." "Our goal is to make sure all the major roads and thoroughfares are pretty clear," Kaminski said. "We’re going to work with the protesters to make sure they have a place to protest." It remains unclear how many people are expected to attend the event, set to begin at noon Monday. 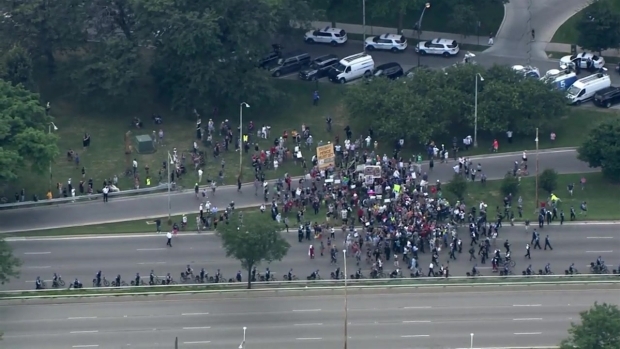 Anti-violence protesters who blocked Lake Shore Drive are threatening to shut down access to O’Hare International Airport. Patrick Fazio reports. Kaminski said residents were being notified to avoid the area Monday. "We’re sending out notices to our residents just to stay away from the area for that time period just as precaution," Kaminski said. "Our goal is to make sure everybody is safe and secure and the event goes off peacefully." The Chicago Tribune reports marchers will gather at the Cumberland Avenue entrance ramp beginning at 11:30 a.m. and continue onto the expressway starting at noon. Livingston, who previously helped organized a march that shut down Lake Shore Drive, said the protest is part of a continuing effort to secure more resources for neighborhoods where the bulk of the city's shootings take place. He has also called for Mayor Rahm Emanuel's resignation. Experts expect about 8 million people will be traveling on Chicago-area tollways over the holiday weekend. "We all share the goal of continuing to build more jobs in our neighborhoods, but rhetoric that ignores reality won't create a single job," Emanuel spokesman Adam Collins said in a statement issued last week. 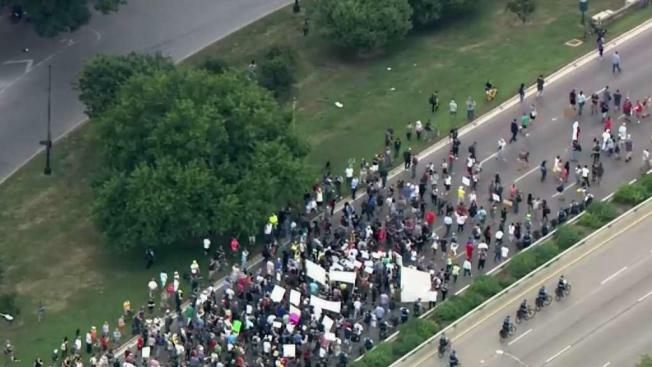 Sky 5 footage shows Protesters as they marched onto Lake Shore Drive, closing all lanes to traffic. "It is beyond ironic that Mr. Livingston would announce his desire to shut off access to the airports to demand more jobs for people living in Chicago's neighborhoods less than 24 hours after the Mayor announced 700 new airport concession jobs are being created and filled by residents in Englewood, Humboldt Park and beyond," Collins' statement continued. "In fact, Mr. Livingston's plans would only harm thousands of people living in neighborhoods across Chicago who earn a good paycheck working at our airports on ground crews, at restaurants, as airline employees and beyond," Collins added. Another march in July organized by Rev. Michael Pfleger shut down traffic along the Dan Ryan Expressway on the city's South Side.